Are you a romantic soul yearning for a Victorian Christmas? If so, you really need to know about the Albany Annual Christmas Parlour Tour of Historic Homes and Buildings. Coming up on Sunday, December 9, 2018, from 2:00 p.m. to 7:00 p.m., the 39th annual tour will feature beautifully decorated historic houses, museums, churches, historic library, and a downtown loft. This is one of only two tours offered per year that include interiors of historic homes. Father Christmas will be out with an enormous bag of treats and the Monteith House and Museum will be lit by oil lamp and fire-light, warming your spirit. Chafin Farms’ beautiful draft horses will merrily transport you around the historic districts with sleigh bells jingling, and the antique trolley will transport you back to a different era. Tour participants will be encouraged to ring the church bell at Whitespires Church and the fireplace will be crackling at the Carnegie Library. While the tour is considered “self-guided,” you can ride either the trolley or the horse and wagon around to each stop (this is included in the ticket price) or drive your own car, trek by bike or two legs, or any other mode of alternative transportation. A map will be provided the day of the tour. This jolly holiday event includes refreshments and loads of happiness, all for the ticket price of $15. Tickets can be purchased ahead of the tour online or the day of the tour, at Albany Visitors Association. We will be giving away three pairs of tickets ($30 value) to the tour! 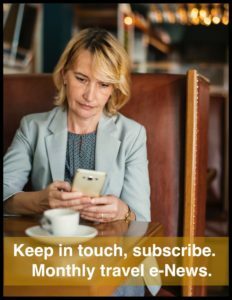 Simply subscribe to our monthly events e-newsletter between November 20th and December 1st to be entered in the drawing. Current subscribers are included. We will contact winners on December 4th. After the Parlour Tour, you have an opportunity to attend an absolutely divine benefit supper. Sybaris Bistro will host a “historic” dinner at their restaurant on December 9th at 5:00 p.m. This dinner is the fourth “Let Kids be Kids,” event, and will raise funds for local underprivileged children to ride the Albany Historic Carousel. The menu includes chilled pheasant pie with wassail jelly, goose “ham,” pease porridge, mock turtle soup, smoked trout kedgeree, roasted pork loin with sugar plum gravy, roasted potatoes, plum pudding with hard sauce, real English Stilton, fruits and nuts, and oat biscuits. The cost is $50 per person, $75 with wine pairing; gratuity not included. Please, don’t be a Scrooge, raise your glasses for kids who need passes! Telephone Sybaris for the all important reservation: 541-928-8157.